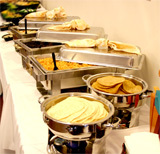 Elijah's Catering is one of the finest catering companies in San Diego. We provide exceptional quality food and knowledgeable service for corporate catering and social events throughout Southern California. Our staff is professional and dedicated to help you plan your event and provide outstanding service. You can order from our catering menu and a variety of holiday/seasonal menus with the options pick-up, delivery or full-service or custom catering provided by Elijah's waitstaff. Our consultants can help you to plan every detail of your event from a menu and beverages to entertainment and valet services. With a large selection of international cuisines such as Italian, Mexican, French or Russian and top chefs you can be sure your event will be a success. Let us work with you to make it happened! You can also pick-up your order at our location in Clairemont Mesa. We can deliver and set-up the food or provide full-service staff upon request. Elijah's can deliver anywhere in San Diego Area, Carlsbad, Escondido, Oceanside, Orange County and even Los Angeles thou some additional charges may apply. Our Banquet Room is available for meetings, conferences and presentations.